Samsung’s Note 7 isn’t the only gadget to catch fire thanks to lithium-battery problems, which have afflicted everything from iPhones to Tesla cars to Boeing jetliners. Blame chemistry and the fact that the batteries we rely on for everyday life are prone to leaking and even bursting into flame if damaged, defective or exposed to excessive heat. That’s because lithium-ion batteries store a lot of energy in a tiny space, with combustible components separated by ultra-thin walls. If something happens to those separators, a chemical reaction can quickly escalate out of control. Still, lithium batteries are so ubiquitous that ordinary users of phones and computers shouldn’t worry. 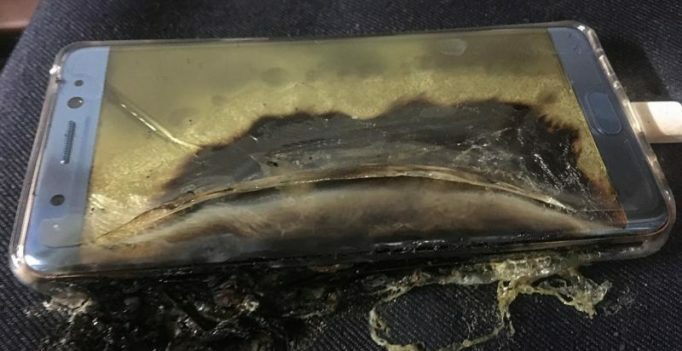 Research suggests that you’re more likely to get hurt by a kitchen grease fire or a drunk driver than the battery powering your iPhone, Kindle or laptop. “It’s not like we live in a world where people’s smartphones spontaneously combust,” said Ramon Llamas, research manager of research firm IDC’s mobile phones team. 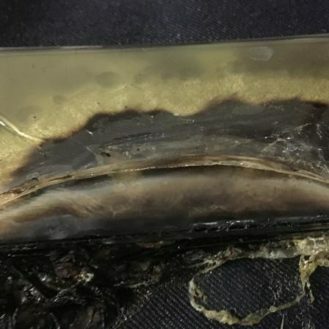 He said owners of Galaxy Note 7s should err on the side of caution and contact Samsung for a replacement that doesn’t run the same risk. Here’s a look at other notable incidents when lithium batteries by themselves or in electronics have caused problems. There have been dozens of aircraft fires caused by lithium batteries, so many that the batteries are no longer welcome as cargo on passenger flights. In one of the most recent incidents, a Fiji Airways Boeing 737 was preparing for takeoff from Melbourne, Australia, when smoke was discovered coming from the cargo bay. The plane was evacuated and the cargo unloaded. The source of the fire turned out to be lithium-ion batteries in a passenger’s checked bags. Hoverboards and e-cigarettes are banned from flights for the same reason. In August, a Tesla electric car caught fire during a promotional tour in southwest France. Tesla said in a statement that it is “working with the authorities to establish the facts” about the fire. The driver was quoted in local newspaper Sud Ouest as saying he answered a Facebook ad offering test drives of the Model S sedan. The driver said he saw smoke, and the three people aboard got out before seeing it catch fire. Tesla hasn’t officially found fault with the battery. But in 2013 , it faced questions when several Model S sedans caught fire after road debris damaged their batteries. Tesla wound up strengthening the battery shield on new and existing cars. Hoverboards, or self-balancing scooters, have been linked with at least 99 electrical fires in the US, according to the the Consumer Product Safety Commission. Hoverboards might be more susceptible than other products to battery fires because they come under more duress than other electronic devices like computers. Amazon, Best Buy and other retailers dumped the products after videos of burning hoverboards went viral. But they reopened sales this year after passing new fire-safety tests. In June HP recalled nearly 50,000 HP, Compaq, HP ProBook, HP ENVY, Compaq Presario, and HP Pavilion computers after seven reports of battery packs overheating, melting or charring, including four reports of property damage totaling about $4,000.